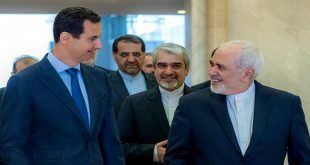 Damascus, SANA- President Bashar al-Assad said that any political idea for resolving the crisis in Syria that isn’t based on eliminating terrorism is a meaningless idea that has no chance of seeing the light; therefore the priority is eliminating terrorism wherever it is found in Syria. 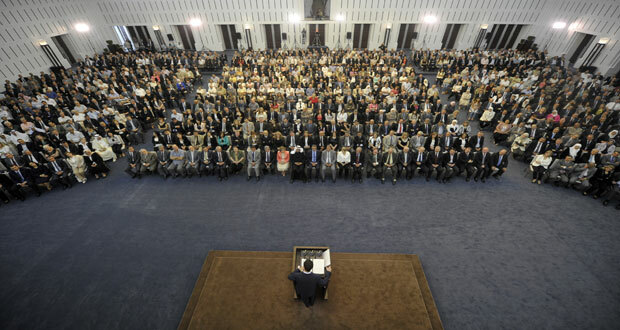 In a speech delivered before heads and members of public organizations, vocational syndicates, and chambers of industry, trade, agriculture and tourism, President al-Assad said that this meeting takes at a time when many matters have become clear and many masks have fallen, exposing lies some sides had wanted the world to believe, and also made refuting the excuses made by those who attacked Syria a waste of time and effort because this talk is self-evident. “Because of this, our questions today as Syrians are no longer about those self-evident facts, but rather about the possibilities facing Syria in light of the rapid accelerating of events and the transitioning of the methodical process of destruction carried out by terrorist organizations to unprecedented levels,” he said. 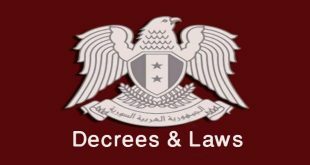 President al-Assad went on saying that this shows the criminal minds of the officials in the states that support terrorism, as well as showing that their previous methods to deceive the Syrian people have failed, and so they increased the scale of savagery of terrorism as their final method to give the Syrians two choices: submit to dictations or be killed. 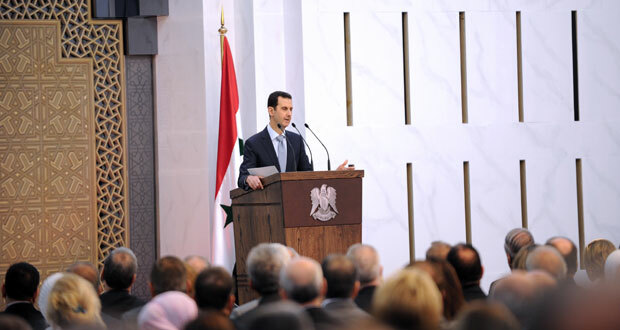 The President noted that this escalation shows desperation due to the steadfastness of the Syrian people who have withstood a war unseen in modern history, and this steadfastness foiled the plans of Syria’s enemies and threatened the political future of many of those who supported terrorism, particularly after the aftershocks of terrorism have begun to affect innocent people in the countries of those who support terrorism, and therefore can no longer use false pretenses to deceive public opinion. 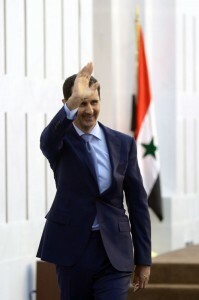 “For a long time, they said that they support rebels and those who demand freedom and democracy in Syria, but their people have discovered that they are supporting terrorists and that the people are paying the price for their governments’ support for terrorists in Syria,” he said, noting that in the past, the Middle East was supposed to be the one exporting terrorism to the rest of the world, but now there are incubators for terrorism in the west in addition to the ones in the Middle East, particularly in the Arab Gulf, and most recently in Tunisia and Libya. The President pointed out that that the latest changes on the international arena are genuine, as a new understanding of the situation in Syria has set in, and there is a better understanding of the lies and false allegations related to the situation, adding that positive changes in the West are unstable and not sustainable given that they stem from concerns over the spread of terrorism that has reached their doorstep, and the likelihood that the Middle East, which is Europe’s backyard, might turn into a hotbed of terrorism. He said that the West is confused because some Arab sides gave them a “simplified recipe” of a bit of controlled terrorism, a touch of toppling states, a dash of chaos, and some changing of faces and rulers, and then they can devour the region. “However, they saw that calculaitons are completely different and things are going in a totally different direction, so I say these changes in the West cannot be counted. They haven’t learned lessons or gained morals,” he said, adding that as long as the West follows a double-standards policy, everything will be temporary and they can’t be relied on in the future, because they can change when their internal and electoral conditions change, and then they will resume their old colonialist policies. The President said that the West’s hypocrisy can be summed up in the fact that they claim to be fighting a monster when in fact this monster is of their own creation and it went out of control. “What they want is to keep this monster in check and not eliminate it. All their military, political and media campaigns are in fact smoke screens, and what the West has done so far has led to a growth of terrorism instead of eliminating it, and this is confirmed by reality, not personal analysis, as terrorism has spread geographically, its material resources have increased, and its manpower has doubled,” he elaborated. 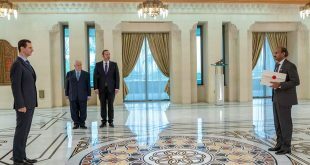 President al-Assad questioned the possibility of expecting states with a long history of colonialism full of occupation, murder, destruction, and exploiting terrorism to actually fight terrorism, asserting that such a thing is impossible because colonialism and terrorism are similar. 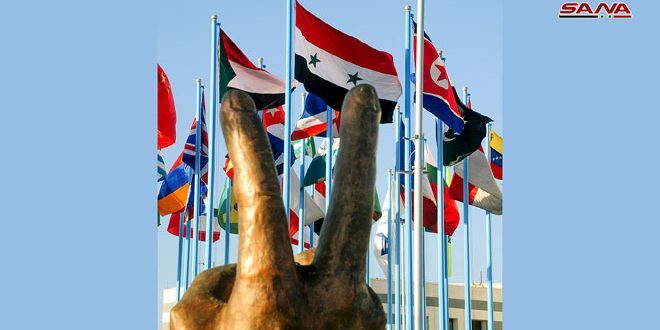 “We have not depended on anyone other than ourselves since the first day, and we expected good intentions only from a few real friends of the Syrian people who have principles and morals, who want stability in the region, Syria, and the world, and who respect international law and appreciate the will of the people, viewing the world in a manner where relations are between equals with no masters and slaves,” he explained. The President lauded the position of the BRICS states and others regarding the crisis, saying that Iran has provided economic, military, and political support to bolster the Syrians’ steadfastness, something that Russia did as well. “Russia, along with China, have constituted a safety valve that prevented the transformation of the Security Council into a tool for threatening peoples and a platform for aggression on states, particularly Syria,” he said, adding that Russia also launched several helpful initiatives to push towards dialogue among Syrians. “Our approach has always been the response to all initiatives that we receive regardless of the intentions behind them, because of our conviction that any chance, no matter how small, to stop bloodshed must be seized,” the President said, adding that this approach also discredits those who doubt and those who are misled into thinking that the crisis is about reform or something similar. The President said that logically speaking, there is no link between political work and terrorism, as the first seeks prosperity and development, while terrorism is all about killing and destruction. He added that the link between the external opposition and terrorists is that they have the same master that is funding, coordinating and calling the shots, at times instructing terrorists to escalate terrorist acts, at others ordering the opposition linked to it to wail louder as a means of bringing about political pressure. The President said that those who support terrorists have confronted the Syrian people with two choices: either to succumb to their will to turn Syria to a satellite state which takes orders from them, or they will go on supporting terrorists to destroy Syria, adding “in summation, terrorism is the real tool, and the political track is a substitute tool. Terrorism is a tool they implement to reach the goals they aspire to. “As long as terrorism is a tool in their hands and part of interlocutors represented by external opposition which is tied to them are part of the dialogue, and as long as they are capable of aborting the political track, then any talk of what they call political solution and we call political track is hollow and meaningless. President al-Assad reaffirmed Syria’s support for the political track, clarifying “but it is one thing to support the political track, and another to be fooled by it,” adding that it is a necessity to strike terrorism for an inter-Syrian dialogue to work out, but the masters of terrorists and the external opposition doesn’t want that, as without terrorism they will lose any ability to influence the course of events. 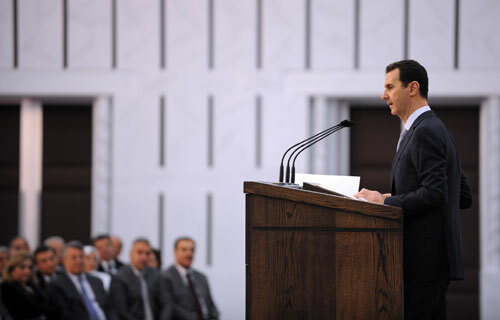 The President said that theoretically, without terrorism, there can be a pure inter-Syrian dialogue, but this is purely theoretical as a part of the opposition represents foreign sides and they are part of the dialogue, which would include three types of participants: patriotic participants, agents of the west, and opportunists who seek to make personal gains at the expense of the homeland. The President said that according to those claims, terrorists want to change their ways, and the West is shedding tears for the Syrians, and the problem lies in the Syrian officials who don’t create solutions or initiatives, which is naive and shows ill intentions, meaning that at the very least, they will blame the Syrian government for any failure. 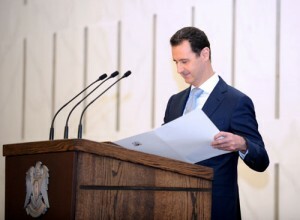 He added that the Syrian state has proposed many initiatives, including amnesty decrees, reconciliations, compromises and law amendments, yet some insist on turning a blind eye to them, adding that these initiatives aren’t mere news articles; they involve actions on the ground that could push things forward or backward, so any initiative has a chance of complicating matters. “If the initiative is directed to enemy forces or opponents and their agents, then it will result in nothing because the only initiative they will only accept is offering the country whole to them and to their masters and making the Syrians their followers and slaves,” the President explained. Commenting on calls on the Syrian state to make concessions, President al-Assad said that only the Syrian people are authorized to do so, and the government doesn’t have authorization from the Syrian people to concede rights, adding that after years of war, the Syrian people have been resilient, sacrificing for the sake of the homeland, and if they had wanted to give up, they would not have waited all this time and paid as much. “The bottom line is: All talk about any political initiative which is not based on eliminating terrorism is meaningless and does not stand a chance to see light,” stated President al-Assad, “therefore, until the political situation is changed and serious efforts materialize, we have no other choice but to continue fighting terrorism. Commenting on the military situation, the President said that the Syrian armed forces have been battling terrorists all across Syria, adding “it is natural that battles have ups and downs, but in the war we are fighting now, the armed forces cannot be omnipresent in every part of the Syrian lands, which makes it possible for terrorists to enter areas and strike their stability until the Syrian army comes to liberate them. This has been happening since the start of the crisis. He added that at the same time, the propaganda machine has been belittling the army’s gains, with the circles hostile to Syria claiming that they would not have been possible without the support of allied forces from countries including Iran. 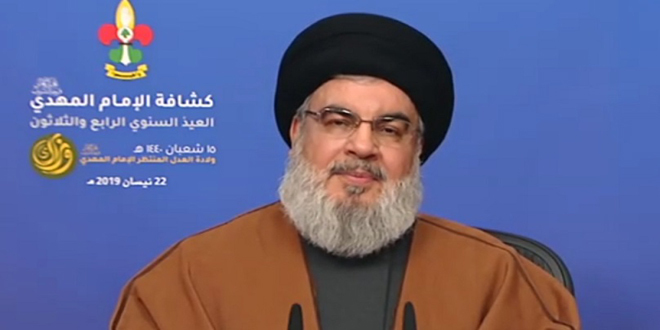 The President made it clear that Iran has only pledged military expertise and nothing else while “our brothers in the Lebanese Resistance have been fighting with us and offered everything in their power. “The blood of our faithful brothers from the Lebanese Resistance has mixed with the blood of their brothers in the Army and they have their prominent role and effective performance along with the Army in making achievements,” President al-Assad said, stressing that it is impossible for any non-Syrian brothers or friends to come and defend the country on the Syrians’ behalf. The President said that Syrians become frustrated when the army withdrew in some areas because the Syrians have faith in the army’s ability, and when someone fails to perform a specific task, those who have faith in them are frustrated, therefore the frustration shows faith and confidence in the army’s ability rather than doubt in it. He said that leadership decisions are governed by priorities and reality on the ground, and the war being waged in Syria is divided among scores of fronts in all directions and areas, with the enemy being backed by the richest and most influential states and having unlimited supplies of personnel, funding, and weapons. “If we thought what we would be victorious in all battles in all areas at the same time, it would be unrealistic and impossible, and this was apparent since the beginning despite the escalation of combat activity,” he explained, elaborating by saying that two priorities are vital areas that must be held as to prevent other areas from falling, and this is decided by numerous military, political, economic, and services criteria. President al-Assad said that the second main priority is the lives of soldiers, who have families waiting for them at home, so decisions take into account the lives of civilians and soldiers alike as they are both more precious than land which can be reclaimed, but a lost life cannot be reclaimed. Regarding elements that impose themselves on the battleground, the President said that first among them is the human element, and in this regard the Syrian soldier showed very high bravery, ability, and skill, but this varies from one person to another, and of course the qualities and abilities of terrorists vary as well, and sometimes mistakes occur in military operations, and even the slightest mistake can have a very high price and lead to a series of losses. The second element is the nature of the terrain, President al-Assad said, explaining that combat in mountains is different from combat in plains and in big cities or small cities or villages and so on, and another important factor is the social incubator, saying that in general the social incubator in Syria supports the state, even in some areas under the control of terrorists, but the degree of support may vary from vocal and moral support which is the basis of support, to material support such as providing food or information, and all the way up to bearing arms to fight alongside the army, something which has been very decisive in winning some battles as fast as possible with minimal losses. “Some might say that it’s the army’s duty to do all that, and that is correct, but that doesn’t prevent anyone from defending their home, their street, their neighborhood, their village, and their city,” he added. Regarding the question of “where is the army in some areas,” the President said that this question, which sometimes comes as a reproach or as a request, should be dealt with transparently, even though malicious media will exploit this issue. “In times of peace, the numbers of the Armed Forces must be sufficient to repel a surprise attack, but when the state shifts to a state of war, the numbers must be increased and this is by calling in the reserves as well as conscripts and volunteers,” he explained, adding that this also entails putting other civilian resources at the disposal of the armed forces according to the mobilization law, which means that the war is waged by the entire country and all of society. 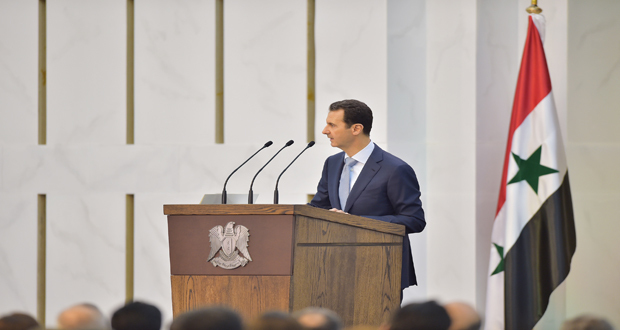 President al-Assad said that in times of peace, there are always deserters and those who dodge military services, sometimes numbering in thousands, and in the times of war these numbers increase several times mainly due to fear. “The army isn’t just weapons and equipment; the army is primarily the manpower that will use the weapons and the equipment, and when we talk about military achievements, these achievements are linked to both the amount and type of equipment and to the number of fighters,” he said, adding that when numbers drop in one army formation, then it will be less capable of carrying out its tasks. “This brings us to a simple and self-evident question… are the Syrian Armed Forces optimally capable of carrying out their tasks well and protecting the homeland? I don’t like exaggerations, so I am giving a scientific, practical, true, and realistic answer: yes, certainly it is capable, and comfortably so,” the President stated. “There are rules in this universe; nothing comes from a void, and nothing goes to a void, nothing moves or changes without energy. The army’s energy is manpower, and if we want the army to give its best, then we need to give it our best,” he explained, saying that while there is a lack of manpower, but he isn’t painting a dark picture as the enemy media will exploit that and say that the president is saying that people aren’t joining the army and this proves that the army and the state are collapsing, and this is simply not the case at all. The President asserted that people are joining the army, and the rate of this increased in recent months. President al-Assad said that in some cases, the army can take its time to carry out a specific mission, but in other cases when there are civilians suffering, like in Aleppo which is being targeted by direct attacks, shelling, and cutting off water and electricity, and like attempting to starve the people of Deir Ezzor and besieging Nubbol and al-Zahra and other area, time becomes a vital element and it becomes necessary to carry out tasks as fast as possible. He said that the Syrian Armed Forces have made achievements that shattered conceptions of theoretical standards of power, and the main driving force that allowed these achievements to be made was will, and will is linked to fighters, and achievements rely on steadfastness along with having the manpower needed to carry them out. The President said that the amnesty decree issued on Saturday seeks to encourage those who have evaded military conscription to join the army, as a few hundred such people have expressed their desire to do so which is why the decree was issued, expecting that there are a few thousands who would benefit from the decree and join the army. “I would like to assert another point, gentlemen; the homeland doesn’t belong to those who live in it, or to those who have a passport or a nationality. The homeland belongs to those who defend and protect it. The people who don’t defend their homeland have no homeland and don’t deserve on,” he said. The President went on to say that along with the military war, Syria has been facing a psychological media war that sought to market and enforce the idea of dividing Syria into entities distributed on supporters-opposition basis and sectarian and on sectarian and ethnic basis, and this approach used the term “civil war” and various sectarian and ethnic terms when talking about Syria to drive those concepts into the minds of Syrians and pass them off as an inescapable reality, and to imply that Syria will never be the same again, which would entail accepting the status quo and submitting to foreign dictations. “In fact, the reality, while complicated, isn’t like that,” he asserted, saying that division doesn’t happen by establishing control over geographic areas, but rather when the people accept or seek it, when the people don’t want to coexist, and this isn’t the case in Syria. 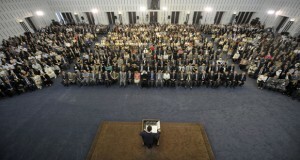 President al-Assad said that before the crisis, many were unaware of the dangers posed by sectarian sentiments, but now the lesson has been learned, noting that there has been no movement of civilians from state-controlled areas to terrorist-controlled areas, nor is there any diversity in those areas; in fact terrorists of various nationalities are on one side, and the rest of Syrians are on the other side, so any talk of division is untrue. 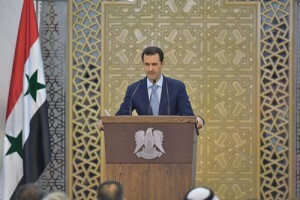 “Whoever wants to assess the situation in Syria adequately should assess it on the popular and demographic levels before assessing it on military and geographic basis, and they should assess it in a deep manner, not in a superficial manner,” he said, asserting that the unity of the people gives meaning to nationalist discourse, and without the unity the discourse is mere rhetoric, which isn’t the case in Syria. The President called for adhering to the nationalist terms that bring us together and unify us, and keep away from the proposed entities and identities some try to market in place of a unified Syria, and from the divided sectarian and ethnic societies they want to replace the cohesive Syrian society. “Therefore, we must be aware of all the terms we use. Some appear, especially in the media, and use the same sectarian, divisive, and fragmentary language used by enemy media, probably thinking, with good intentions, that they are being realistic and objective, when in fact they are being superficial and aren’t aware that reality begins with ideas and words,” he said, adding that when we accept these terms as part of our culture, we must accept that division or fragmentation will become reality in a few years, so one must be careful when choosing terms. Addressing the economic issue, the President said that livelihood is now the concern of every family and person, and particularly people with limited income, which is inevitable due to the war which has affected Syria’s economy and the state’s resources, not to mention the terrorist attacks that target the economic and services infrastructure. 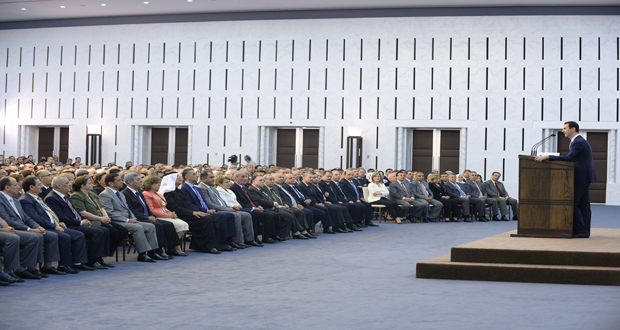 President al-Assad said that despite that, some institutions could have done better, but the will and resources to improve are available, and what is left is to organize and be creative to move towards better things. 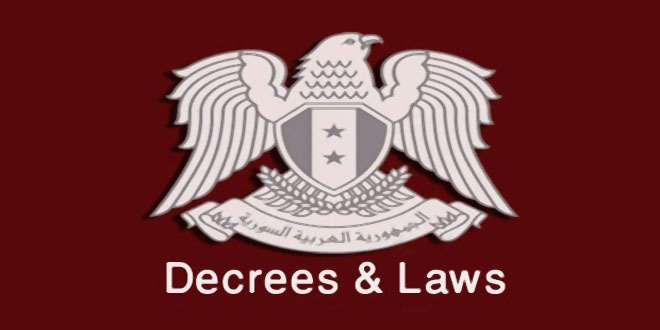 He pointed out that the most promising sector in the current circumstances is the sector of reconstruction, and the law which opens the door wide before this sector was passed, and the organizational plans were set for the first of the reconstruction areas in Damascus, and studies are being prepared for other areas including ones in Homs and Damascus Countryside. 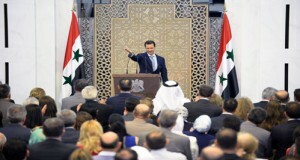 The President added that despite the difficult circumstances, there has been activity in other investment sectors, with factories being set up in safe areas in Damascus Countryside and Homs, while other factories that were being built before the crisis have been finished, and some have even launched investments during the crisis, which shows a high degree of patriotism and faith in Syria. He said that the sectors that have suffered the most, like poultry, livestock feed, food industries, textiles, and pharmaceuticals, have undergone procedures that overhauled them in various degrees ranging from the acceptable to the good, and the government worked to support small and medium-sized projects via loans, with small and micro-loans being a successful experience carried out by the civil society with the government’s support, creating tens of thousands of job opportunities. 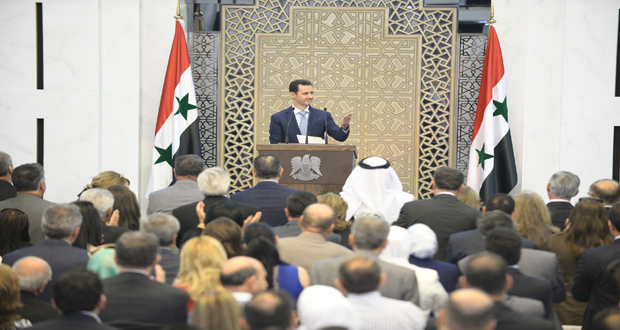 President al-Assad struck an optimistic note despite the grim toll that the crisis has taken on the economy, reminding of the tough years that the Syrians have endured, citing in particular 2012 when the Syrian people managed to cope with an unprecedented economic downturn. He noted that Syria has started to export goods, and production has gotten underway and some sectors have started to function, which are good signs, with some lingering obstacles regarding the service sectors such as electricity and fuel. The President said he is optimistic about the military situation in light of the Syrian state’s capabilities, but said he can promise nothing when it comes to the political track, as there are many elements that influence political work, elements other than Syria’s friends like Russia, Iran, and China, and the other BRICS states. “We are at a critical stage where there can be no middle grounds, where hesitation is equivalent to cowardice, defeatism and treason,” added the President, affirming that Syria is determined to stand its ground and to never relinquish its rights, lands, freedom, and sovereignty. Commenting on the Iranian nuclear deal, President al-Assad hailed it as a great victory that crowned the struggle of the Iranians who have endured three decades of blockade and an 8-year war that left much of its infrastructure in ruins, emerging strong and making great scientific achievements, despite all the attempts to undermine it which it overcame thanks to the unity of the Iranian people. 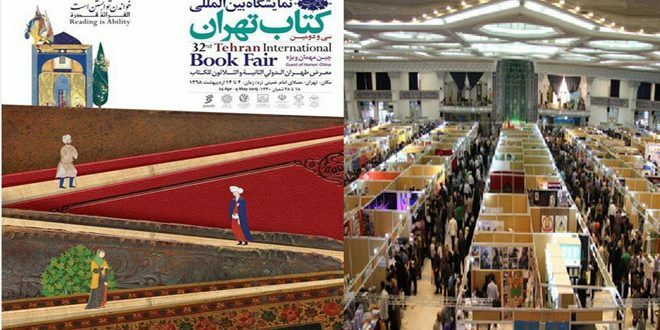 The West, he went on to say, has placed the bets on the imminent fall of Iranian regime copying the same scenario that they attempted in Syria, commending the position of the Iranian opposition which placed the interests of their country and its rights to have nuclear power above political differences. “The price is high because the scheme is formidable. The war is a war of existence; to be or not to be,” the President said. “As Syrians, we won’t be able to save Syria unless everyone feels that this battle is their own,” the President said, indicating that Syria’s victory will bring stability to the entire region as the region’s future hinges on Syria’s. The President urged those who are hesitant or who doubt or still entertain illusions fed by foreign sides to turn towards the real enemy which is terrorism, asserting that promises made by external forces will remain delusions as long as the Army and Armed Forces are fighting for Syria to live. 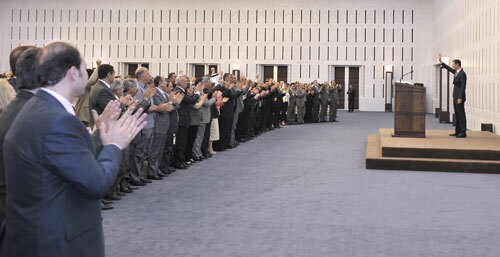 President al-Assad concluded by saluting the members of the Army and Armed Forces, popular defense forces, and their families, particularly the families of martyrs, in addition to saluting those who were injured in the battle against terrorism, promising to spare no effort to rescue abductees and missing people, thanking Russia, Iran and China for their support, and finally saluting all Syrians who stood fast and challenged terrorism, remaining committed to their homeland despite all difficulties and temptations.